A pioneer in remote support services for more than two decades, Case offers 24 hour on-site or remote support sessions that are professional, prompt and results driven. Prepaid AirSupport contracts are discounted and simplify PO authorization in emergencies. 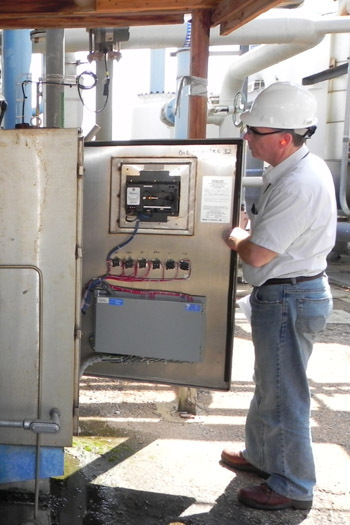 AirSupportE (Enhanced) programs offer extended warranties and other proactive services that provide machine performance data for preventive and predictive maintenance activities. AirSupport can be administered remotely. If VPN access is not available, Case will provide a cellular modem giving access to all networked compressor controllers. The modem is provided with the purchase of new systems and can be purchased seperately for existing systems. Case can then make diagnostic service calls to all compressor controllers on the network at your request. You have control over the modem and must turn it on to allow access. Services are billed by the hour and prevailing rates for premium time like holidays and weekends apply. You may pre-purchase hours of remote service time at a discounted rate simplifying administration of future service calls. Support plans are available with proactive services and extended warranties. Ask Case to help you pick the right plan for you. Whether proactive or reactively responding to your request, we are able to perform a number of tasks while connected to your controller. Your compressor doesn’t need to be shut down to perform most of these tests.